Sets CPU descriptor handles for the render targets and depth stencil. The number of entries in the pRenderTargetDescriptors array. Specifies an array of D3D12_CPU_DESCRIPTOR_HANDLE structures that describe the CPU descriptor handles that represents the start of the heap of render target descriptors. In this case the driver dereferences the handle and then increments the memory being pointed to. In this case the driver dereferences three handles that are expected to be adjacent to each other in memory. 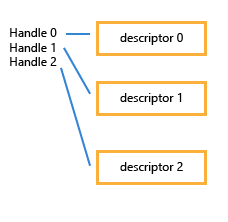 A pointer to a D3D12_CPU_DESCRIPTOR_HANDLE structure that describes the CPU descriptor handle that represents the start of the heap that holds the depth stencil descriptor.